Kaitiaki Farm is among the most diverse permaculture farms in New Zealand. Our holistic approach to land management includes all of the 13 acres – taking advantage of micro-climates, soil types, and hydrology. The farm is opened twice a year to the public: September and March. As part of the 5th Annual Whanganui Permaculture Weekend we are offering a walking farm tour on Sunday 10th September from 9:30-12:30. The tour will cover: organic market gardening; the best tools for farm and garden management; tractoring fowl; water management; building soil fertility; wind breaks; orchard planning; erosion control; slope stabilisation; stock rotation; wetland restoration; and, eco-building. 223 No. 2 Line. Please park on the road. $25 per person. Stay-and-Learn B&B packages available for out-of-town guests. Whanganui Permaculture Weekend is a grass roots, dirt-under-your-fingernails, no nonsense event for anyone serious about realistic solutions for a troubled world. This is one place that Whanganui punches above it’s weight – with some of the best permaculturists and educators in the nation. The 5th annual event features at least four workshops by Whanganui locals who are the top of their field in New Zealand. Yet despite this expertise all the programmes are offered at affordable rates – most likely the best value weekend of learning anywhere in the country. And we’re doing our best to make the event child-friendly this year, with a number of great workshops focused on children, including Rope Making and Rourou Making, Outdoor Classrooms, and an up-close-with-farm-animals BBQ on Saturday night. 1-3 “Intro to the Community Game” WRRC Education Room, 83 Maria Place. Laurence Boomert. 1:30-3:30 Suburban Permaculture Property Tour. 106 Matai St. Phil Holden. By Donation. 5:30-7:00 pm Shared Meal BBQ. Kaitiaki Farm, 223 No. 2 Line. CANCELED EXCEPT FOR OUT-OF-TOWN GUESTS. B&B Packages include accommodation, dinner on Saturday, breakfast on Sunday and admission to all workshops. Private room/shared bathroom: $170/couple or $95 per person. We have a cosy studio with amazing views available for the winter. Experience holistic land management, animal husbandry and ecological restoration on one of the country’s best permaculture properties. For less than the cost of a PDC you can spend three months experiencing permaculture first-hand. Includes free wifi, private bathroom, washing machine, etc. Close to town. For more details contact: theecoschool at gmail dot com. Could this be the best value permaculture property in New Zealand? Lovingly renovated seaside villa combines old and new to achieve a sunny, warm, dry and comfortable home while retaining distinctive retro character. Over the three years we lived here our power bills averaged $26 per month while running a refrigerator, freezer, washer, hob, jug, wifi, etc, and enjoying abundant hot water. Much of the interior features native hardwood built-ins such as this three and a half metre rimu shelf unit. And this bespoke totara and rimu vanity. The kitchen features hardwood shelving with antique lead light doors and vintage light shades, along with a new Tasmanian oak floor and cosy old school Shacklock cooker. With great indoor/outdoor flow, the living spaces are bright and airy throughout the day. A pizza oven and vege gardens are just outside the French doors. The private back yard is lined with fruit trees and natives while retaining enough lawn for a play. Over 30 productive fruit trees fill the 700 square metre section. Grapes and Jerusalem artichoke fill the spaces in between. New roof, new cladding, insulation and solar hot water are among the features of this highly resilient home. This property has been featured by the national and international media and represents a gold standard in suburban permaculture. The renovation is the only case study outside of Australia to be included in David Holmgren’s current project: RetroSuburbia. All of this can be yours for 85% less than the average bog standard Auckland home. Enquiries through the blog’s home page. Or comment. Whanganui’s premier sustainability event is back for a forth year with a fantastic line up of events during the weekend of September 10th-11th. The Whanganui Permaculture Weekend highlights innovative local projects, offers hands-on workshops, a seed swap, working bee, shared meal and movie night. Education is a highlight of this year’s programme, which includes highlights of teaching and learning at the secondary school level, the tertiary level, and adult learning. The Permaculture Weekend wraps up Adult Learners’ Week/He Tangata Mātauranga, which is brought to the River City by Adult and Community Education Aotearoa, the Whanganui Learning Centre, and The ECO School. On Saturday Nelson Lebo of the ECO School will offer two workshops on backyard food production: an introduction to organic gardening and fruit tree care, and an organic gardening master class. Some events are offered on a donation basis while fees may apply to others. Some are free. The full schedule is below. Free if otherwise noted. 11-1 Rope Making and Rourou Making, Tracey Young, River Market. Meet river side of i-site. 3.45-5 Composting workshop – Practical – Rachel Rose, 77 Anzac Parade. Wasted time. Wasted money. Wasted opportunity. These are the things that have defined Whanganui for far too long. So says eco-entrepeneur Nelson Lebo who today announces his candidacy for mayor of the city. “If we’re so good at waste, let’s make it our primary industry,” said Dr Lebo, who joins deputy mayor Hamish McDouall and councillor Helen Craig in standing for the mayoralty at October’s local body elections. Launching his campaign with the slogan “Our Waste is Our Salvation” along with the hashtag #WastedLebo, he wants to revitalise Whanganui’s economy, create jobs and cut rates, according to his 280-page manifesto titled What Whaste Whanganui? His ambitious plan is based around a complete alternative to the council’s proposed $38million wastewater treatment plant, dealing with the waste disposal issue at no cost and, he claims, actually producing revenue. According to Dr Lebo’s calculations, the construction costs for the new plant, plus interest and operating costs, translates to $80 million over the next 20 years. “We take $20 million of that and install composting toilets in every household in Whanganui,” he told the Chronicle. The fats and proteins from the Heads Rd industry waste would be directed to a new soap-making company; while organic industrial waste would be made into compost and sold. “In a strange twist of fate, it may turn out that the very substances that caused the pong can be turned into cha-ching,” he said. Dr Lebo, an American eco-designer who has lived in Whanganui for more than five years, has secured preliminary rights for the Australasian franchise of the Paper Street Soap Company. A difficult and costly repair job after the flood. From my reading of Brian’s Conservation Comment, he makes two main points in the second half of the piece: 1) climate change will bring more frequent extreme weather events; 2) redesigning our farms to work more closely with nature will save farmers money in the long run. As any regular reader of this column recognises, these are two of the central tenants of eco-thrifty renovation. When eco-thrifty thinking is applied to the land it can be called “holistic land management” or “permaculture” or “ecological farming.” Whatever you call it, it relies heavily on pattern recognition. 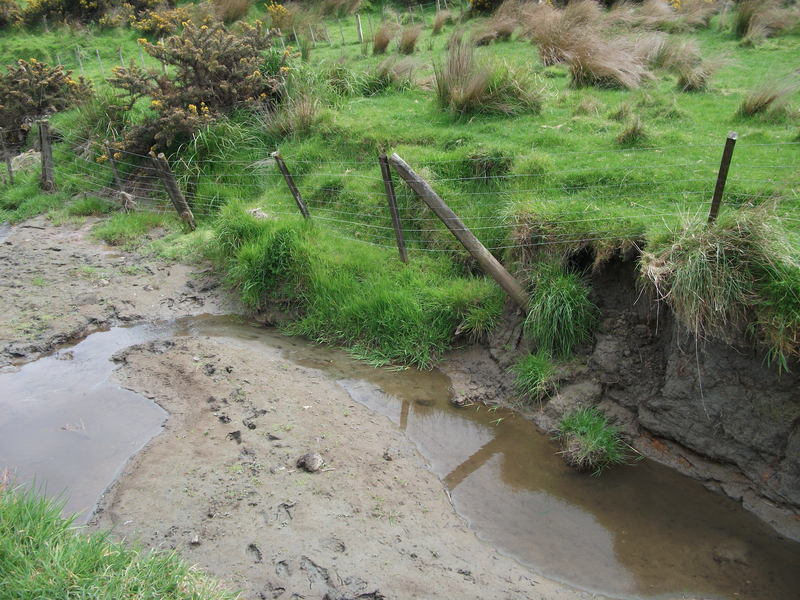 Specifically, the patterns that Brian addresses are ridges and gulleys and the best locations to place tracks and fences within the landscape to minimise damage from slips. This is sage advice, and we wish Brian could have been on the committee that chose to move the Sargent Gallery into a floodplain. Designing with recognition for the patterns in nature has two clear advantages for farmers: 1) higher productivity; 2) greater resilience. In the day-to-day workings of a farm, holistically managed farms are more profitable, and during extreme weather events – either storm or extended drought – are more resilient. And who would have guessed that ex-farmer and current Letters writer G.R. Scown was an eco-farmer long before it was fashionable?!? I admit to pleasant surprise as he waxed eloquently (Letters, 22-10-15) about worms, soil bacteria, humus, moisture retention and seaweed. Similarly, I have experienced great results in pasture quality using some of the methods Scown describes along with rotational grazing. The result is a win-win-win situation that includes a healthier mix of pasture species, healthier animals (from eating better plants), and a resilient farm better able to weather both ends of predicted weather extremes. A recent study by researchers at Stanford and Berkeley published in the journal Nature concludes that, “Climate change could cause 10 times as much damage to the global economy as previously estimated, slashing output as much as 23 percent by the end of the century” (Bloomberg News). Another recent report identifies that “Land degradation is costing the world as much as $10.6 trillion every year, equivalent to 17% of global gross domestic product” (Guardian, 15-09-15). But none of this would be news to our outstanding regional council. For a long time, Horizons has taken a holistic, proactive and hands-on approach to land management and working with farmers. I have nothing but respect and admiration for the leadership shown by Horizons and the high quality advice and support offered by expert professionals. I have been impressed with more than one regional councillor’s understanding and advocacy for holistic perspectives on issues ranging from watershed management to environmental education. Getting rid of the “Green Rig”, for example, was an excellent decision. Poplar poles planted this winter on a vulnerable hillside. I have also worked with a number of Horizon’s staff on issues of soils, slopes and tree planting. The advice was top notch and the customer service outstanding. I actually enjoy paying my rates because I know my dollars are doing great work. Speaking of which, I seem to recall reading that the regional rates bill was going to increase by $2 per household to buy more poplar poles for farmers. I reckon that should be doubled because decades down the track we’ll all be better off for it.